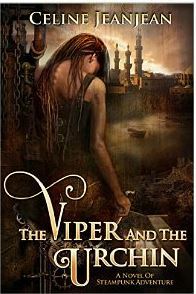 The Viper and the Urchin is a rollicking good tale which grabs you by the collar and sweeps you through the grimy streets of Damsport with humour and nail-biting danger. Its heroine, Rory, is a small scrawny urchin, scraping a living by theft and deception, who makes an unlikely alliance with the elegant Viper, an assassin who uses only poison on his victims and takes pride in his art. There are several other vibrant characters too, such as Cruikshank, the engineer who has designed a large mechanical spider to transport them up walls & over roofs, the Old Girl or Marchioness of Damsport who rules the state and the Scarred Woman, a mysterious swordswoman whom Rory wishes to emulate. The city environment is vividly described, dirty and crowded with Banyan trees sprouting out of cracks in the radiating streets. I could visualise the Varanguards, costumed in the style of Varan, a dancer who hid knives in her hair, wearing horsehair ponytails as part of their helmets. And I would love to board Crazy Willy, the wild beast of a steam coach which races through the streets each night. This exciting story contains all the essential ingredients of a fantastic steam-punk adventure, including a tough but vulnerable heroine, an intriguing companion, an evil foe and even a vague suggestion of a romantic interest. It is the first book of The Bloodless Assassin Mysteries and I am very much looking forward to the publication of the next one. I have to agree with your review. I absolutely LOVED this book, and can’t wait for the next one. I’ve never read any steam-punk but you have made this sound like this is where I should start. Mortal Engines by Philip Reeve was the first steam-punk book I read & enjoyed. They are like stirring Victorian inventors up with fantasy imagination. The cover is a perfect fit for the story, even including Rory’s rope-like hair. Steampunk isn’t a genre I have got into either, but this is such a wonderful review, it sounds an exciting read.